Where else but at The Grammys are you going to see Post Malone rock out with the Red Hop Chili Peppers? After Post performed some of his hits, out came the rock icons for an epic collaboration! At this point, the Grammys are more known for its odd collaborative performances than for giving away awards. The 61st edition of the music awards ceremony was no different. The Feb. 10 show booked Dua Lipa to team up with St. Vincent, Camila Cabello to share the stage with Ricky Martin, and Katy Perry to join Kacey Musgraves, Marren Morris, and Little Big Town to pay homage to Dolly Parton. After that, the teammate between the Red Hot Chili Peppers and Post Malone, 23, seems somewhat normal. At first, it seemed as if it was going to be strictly Post Malone, who hit the stage to perform his massive hits “Stay” (which saw him start off solo, sitting on a stool, with an acoustic guitar) and “Rockstar.” Except, when you’re talking rockstars, and you’re at the Grammys, you just NEED some rockstars to rock out with you, right? 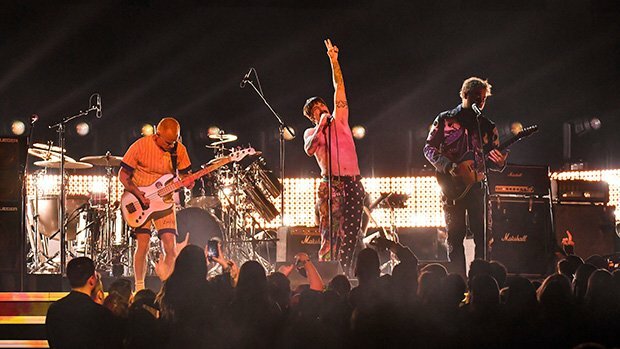 Enter in the Chili Peppers, and with Post, the group performed their song, “Dark Necessities.” Post’s smile was from ear to ear, as the legendary group got down…which getting everyone at the Grammys up on their feet. This isn’t the first time Post joined an iconic rock band on stage at an awards show. He, 21 Savage and Aerosmith closed out the 2018 MTV Video Music Awards. The performance began with Post and 21 Savage performing “Rockstar” – which won the VMA for Song of the Year earlier in the night, per Rolling Stone – before the iconic rock band emerged to join Post on stage. After performing “Dream On,” Post joined the group for “Toys In The Attic.” Post even leaned in to join Steven Tyler and Joe Perry, sharing a single mic in a shot that probably checked off an item on Malone’s bucket list. Add his four Grammy nominations and it’s a pretty good night for Mr. Austin Post. The plan is to rock the Pyramids. On March 15, following RHCP’s tour of Australia and New Zealand, the band will head to the Great Pyramids of Giza in Egypt. The band will join the handful of groups that have played the pyramids – Pink Floyd in 1971, the Grateful Dead in 1978, Shakira and Mariah Carey after 2000. Here’s hoping that their album will be out afterward. The group began work on their twelfth album in 2017, but the Woolsey Fire that destroyed more than 1,500 homes in southern California forced to evacuate the studio and thus, delay work on the record. It should be out later this year, fingers crossed.